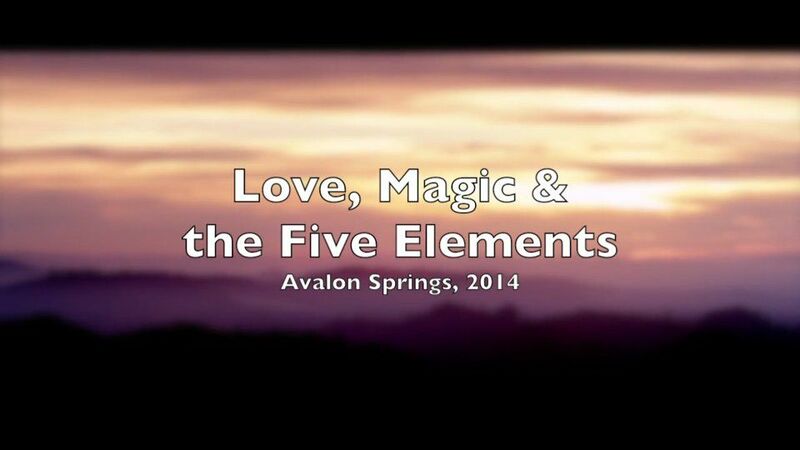 Join us for this special women’s retreat at Avalon Hot Springs in Northern California. Be surrounded with the beauty of nature, love & kindred spirits, and have the best weekend EVER. Many believe that the word “SPA” originates from the Latin “Salus Per Aquam” or “Wellness Through Water”. Since early times, people have gathered around these natural springs to access their healing power. Avalon’s pools feature pure mineral spring water, flowing from three distinct hot springs sources, with no chemical treatment whatsoever. Relax and unwind in the Magnesium-rich Medicine Spring Water. Experience the skin-softening effects of the Boron-rich Mother Spring. Melt away tensions while feeling the strengthening effects of the Iron-rich Dragon Spring. In addition to the soaking springs, Avalon boasts a variety of special mineral drinking waters which can be enjoyed straight from their place of emergence in the rock. 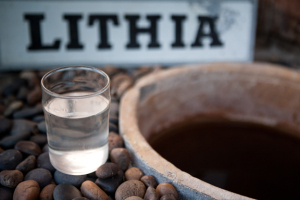 One drinking spring is high in Lithium – a mood elevator commonly used to treat Bipolar Disorder. Other springs include a bubbly iron soda drinking spring, a Magnesium-rich “laxative” spring historically named “Dynamite Spring” and Bohemia Spring, which was considered a hang-over tonic to cure the effects of over-indulgence! The land of Avalon Springs commands panoramic views beyond Big Canyon’s wooded valleys and into the Mayacamas Mountains. The wind blows soft and steady from the ocean across the tops of the foothills to the West. A majestic rock face stands guard over the plateau where future guest residences are to be built. The lodge, spa bathing area, and wellness center are shaded in the hot summer months by the hilltop called Tor of Avalon (a tribute to Avalon in Glastonbury), which sits on the south side of the property. 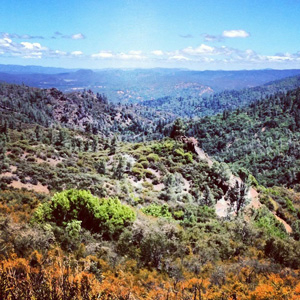 The view plateau commands a breathtaking panorama of Boggs Forest, Big Canyon Valley, and the Maycamas mountains beyond to the east. This land has been held sacred by the local community, both modern and native. The kitchen at Avalon Springs draws ingredients straight from the garden, offering an ample buffet-style meal plan and a juice and snack bar available for breakfast and between-meals needs. Entrees for meals at Avalon will include some organic local meats, fish, and poultry as well as ample fresh vegetarian fare sourced from local farms and Avalon’s own gardens. Raw food delights will also be showcased on occasion to feature the potency and taste of the freshest produce available. With every meal introducing healing foods preparation including raw food delicacies, superfood juices, and healing teas, dining at Avalon is a healing experience. 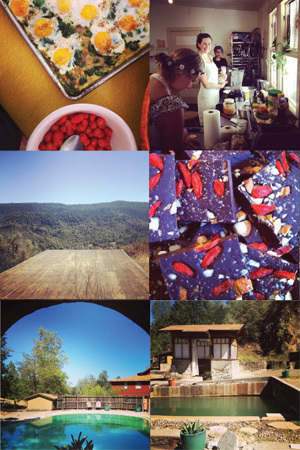 Our retreat will have no dogmatic restrictions on diet, allowing each one the freedom to explore options and choose their own ways to nourish themselves naturally. 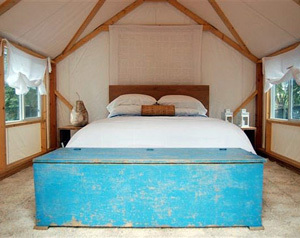 Avalon has the perfect mix between rustic living, cozy comfort and spa goodness. The rooms are old and are still being refurbished so aren’t super fancy, but are comfortable and cozy. Most of the rooms have a sink for washing but use a shared bathroom by the pools or in the lodge like the original hot springs was set up. The food and the waters are top notch and are as healing and tasteful than any resort, if not more so. The all around vibe is familial and you’ll feel like you’re diving into yourself while being supported by the land, the waters, the food, the atmosphere and most of all the people. If you’re looking for a sterile 5 star $400/night hotel, this isn’t for you! Note: Everything is optional! We wish to honor your own sense of what you need. This time and place are a sanctuary for you to do exactly what moves you, and still feel held. If the best way for you to relax and reset at any moment is to soak alone, sleep in, or skip a group, do it!! Also please note this schedule is subject to change! 1 – Lunch and go! Tatyanna is the founder of Whole Medicine. Her practice combines the rich 4,000+ year old wisdom of Classical Chinese Medicine–gleaned through 15 years of study with an 88th generation Daoist master–with her own mystical cultivation. She believes healing and peace dwell on the path to our own true nature, and that nature itself can be the best teacher. She brings to this retreat her great reverence for the sacred feminine, creativity and play, ritual and transformation, comfort and nourishment, stillness, and love. Gitanjali founded Source Healing, an energetic healing modality that works by building congruence & coherence in the energy fields that give rise to thought and form. 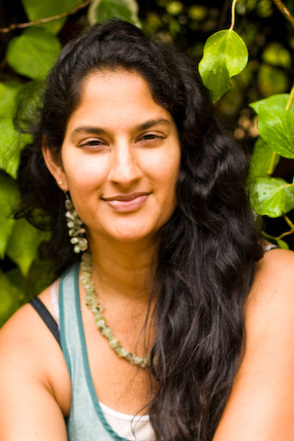 Gita has studied with masters and teachers from all over the world, enriching her own vast connection with Source energy. She believes that as each of us aligns and expresses our own authenticity, the potency of this newfound freedom and creativity ripples out into our families, communities and worlds, gracefully transforming our planet. She is honored to dive deep and soar high with you in this magical summer retreat. Please see our reservation and cancellation policies. By reserving your space you are agreeing to the stated policies in our agreement.